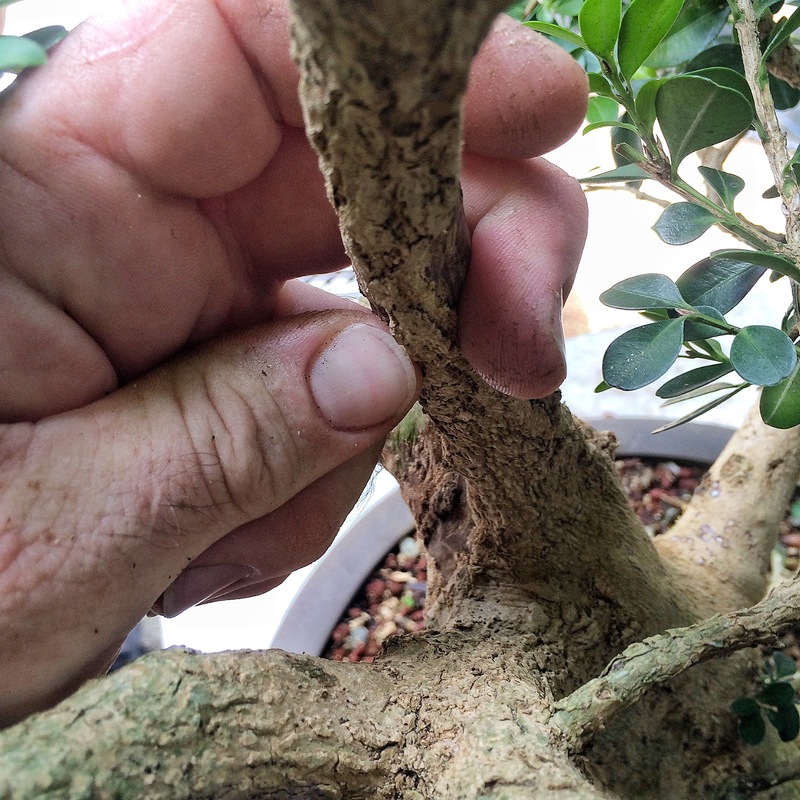 Time to trim my boxwood. Way over time actually. It’s late September here in the hot F-L-A. So maybe it’s not a good time for you….or maybe so…..depends on your first frost date usually. I won’t have a frost until maybe January, February (that’s right, that’s how we roll in Florida…). 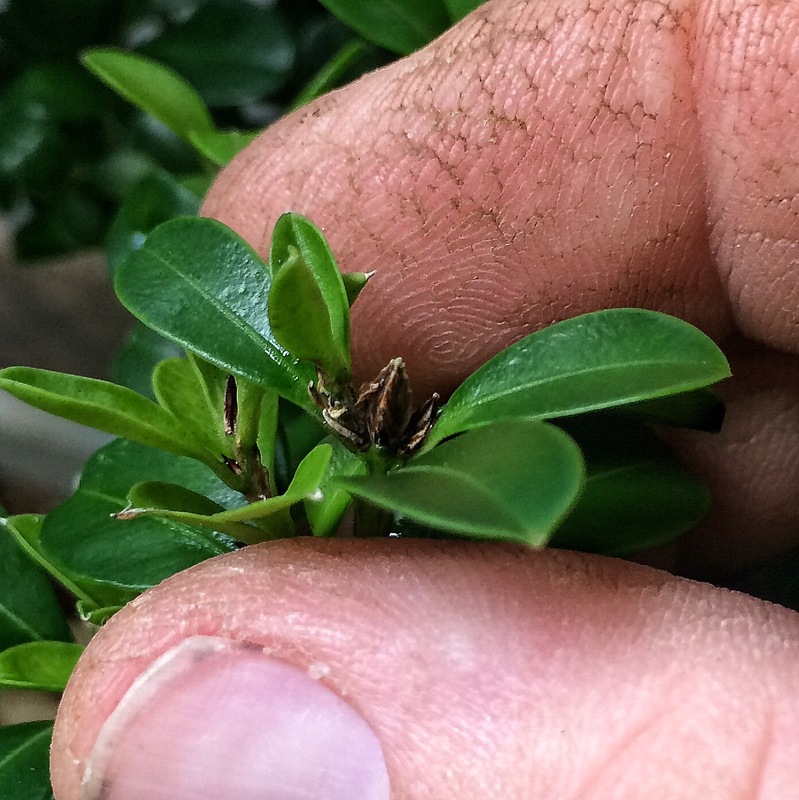 If you have the time for new growth to harden off before your first frost, go ahead and trim. I’m going to say at least a month or even two. 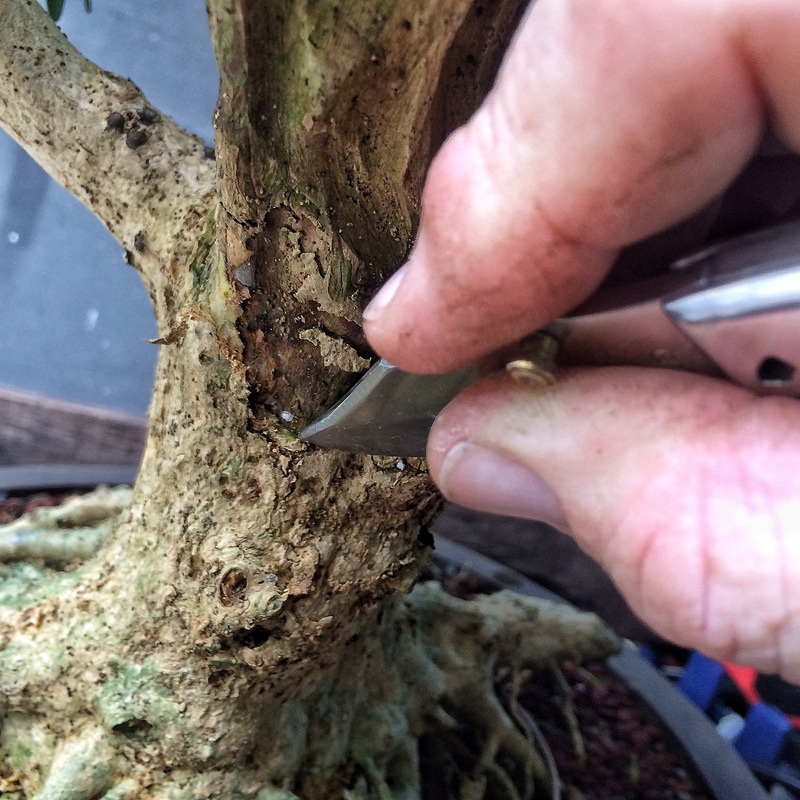 Or, if not, and you want to trim, you’ll just have to protect the tree over the winter. 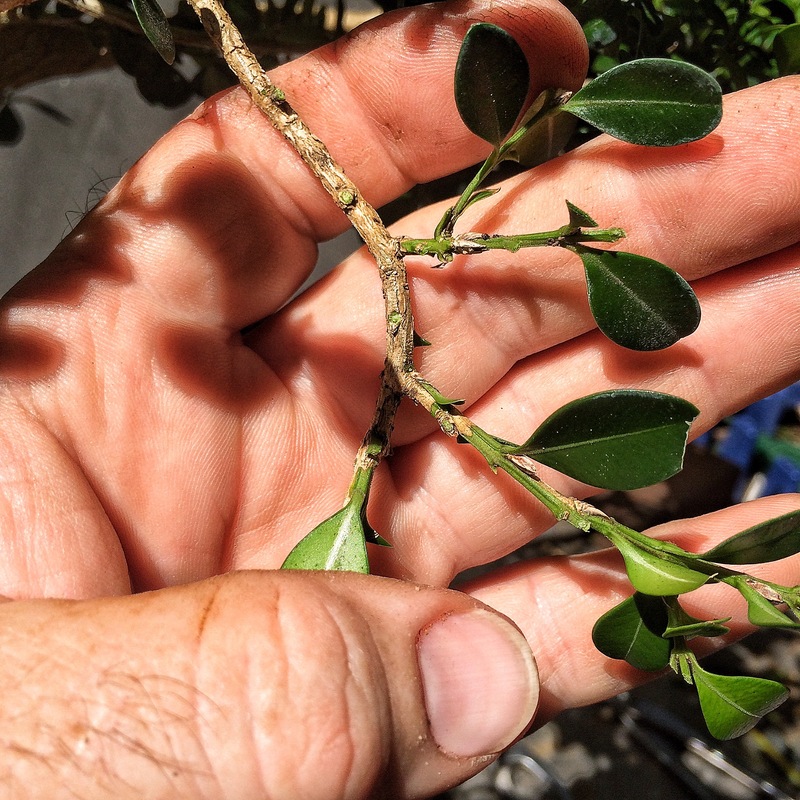 On the boxwood, that means the new growth has turned from light green to dark green and the leaf has actually hardened, it’s waxy and shiny. 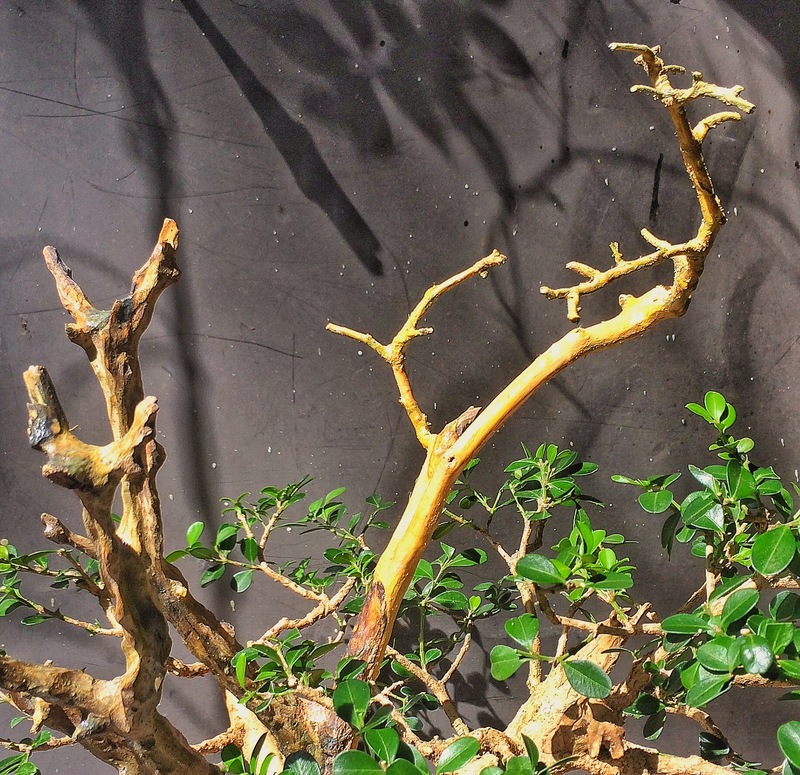 The new growth is almost rubbery (called “succulent” by horticulturists and gormands…well, not gourmands, unless they’re talking about roast duck) and dull. 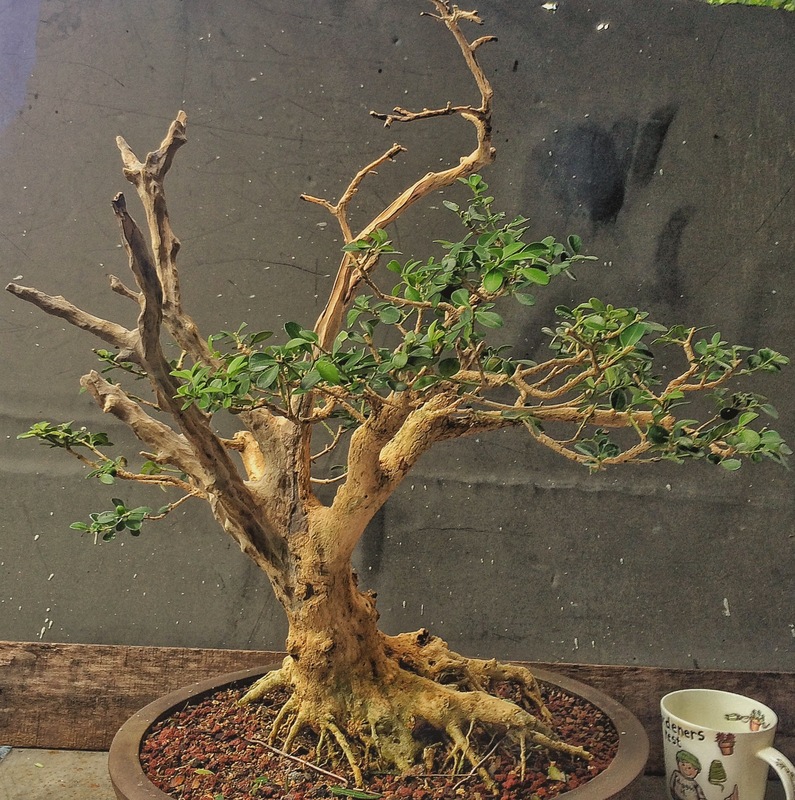 You’ve seen this tree before (click here to see its wonderful and amazing journey, filled with sketches, diagrams and 9×10, full color, glossy photographs to illustrate the story, there’s even a video with some awesome music here) I’m going to clean and treat the deadwood and define the live vein. Or rather, I’m going to show my student Johnathan how to do it and sit back to take pictures. We discovered a startling discovery. The bark is only living here, between my fingers. I’d say only about 20-25% is alive. Let’s look at the tree again. 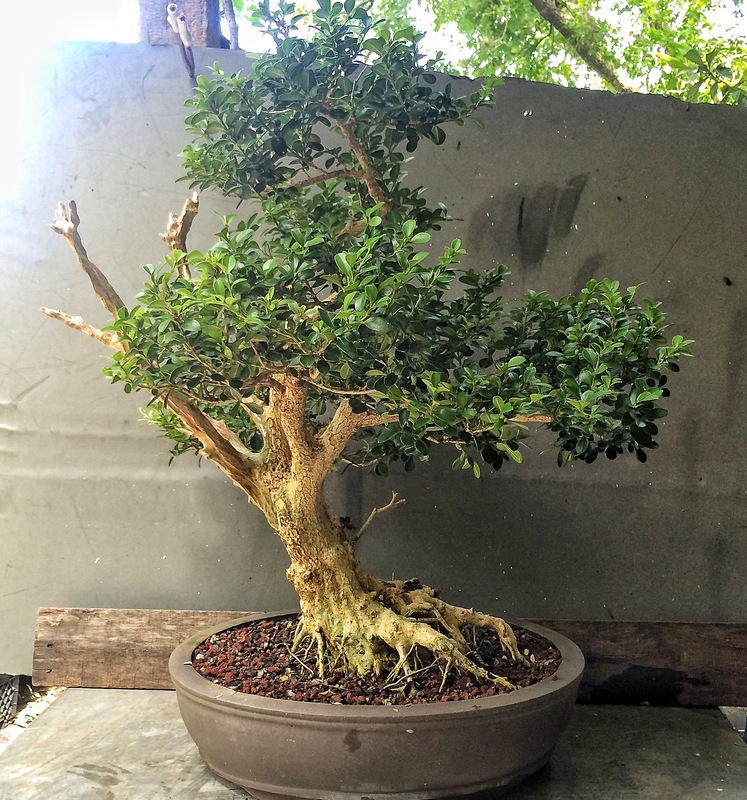 This isn’t a juniper. 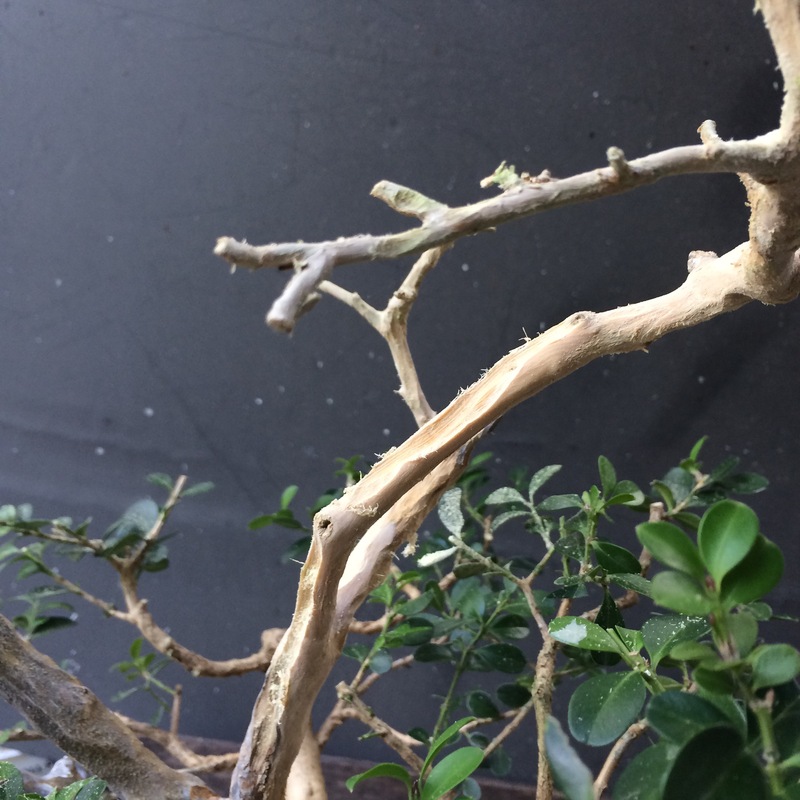 The thin live vein will keep deteriorating and the top will ultimately die. I’m thinking that this is an opportunity. An opportunity for ART! Or at least some artful chopping. And it gives Johnathan some more work to learn on. Peeling the bark with a Jin plier involves crushing said bark with said plier and then peeling said bark off the tree. Once you get the hang of it, it’s easy-peasy. It’s starting to come together. Needs a little haircut though. And it’s really just a return to basics. 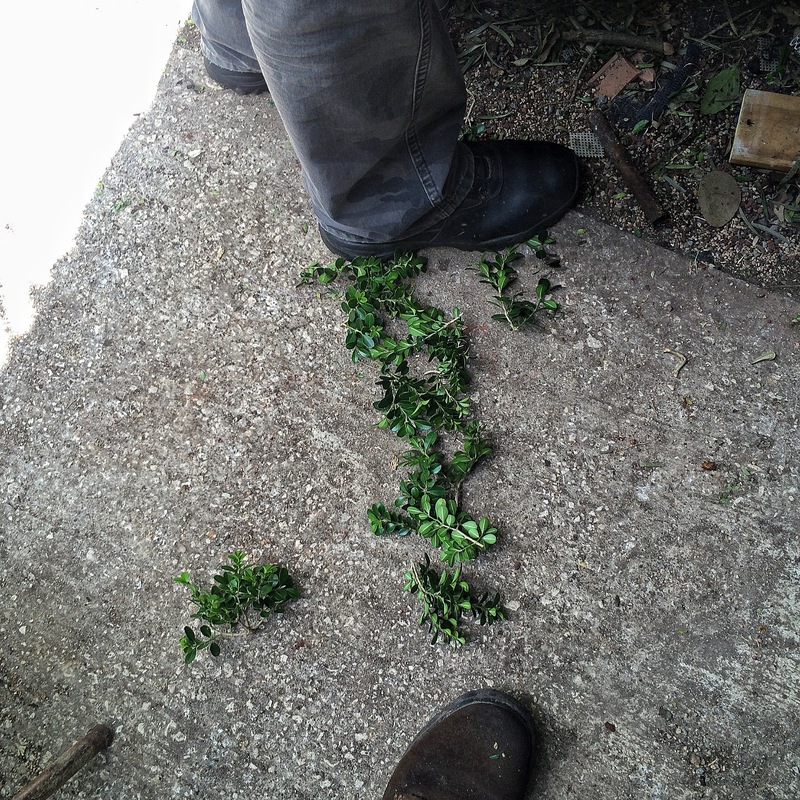 Remove the older leaves. 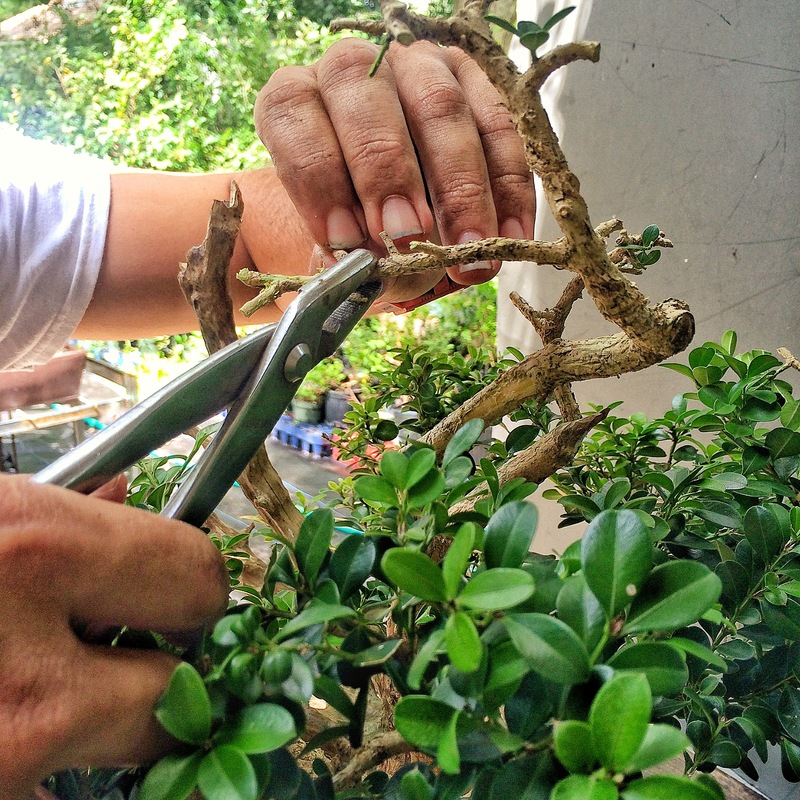 Make sure the shoots growing from on the top and the bottom of the branch are removed. 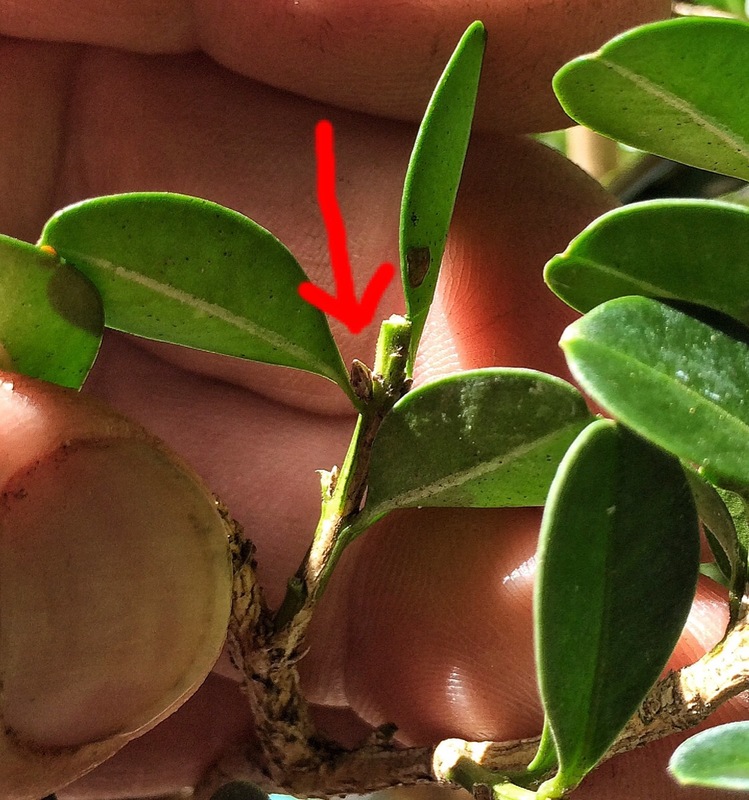 Any shoots in the branch crotches and where there are more than two emerging from branch junctions should be removed. We want forks, not tridents. 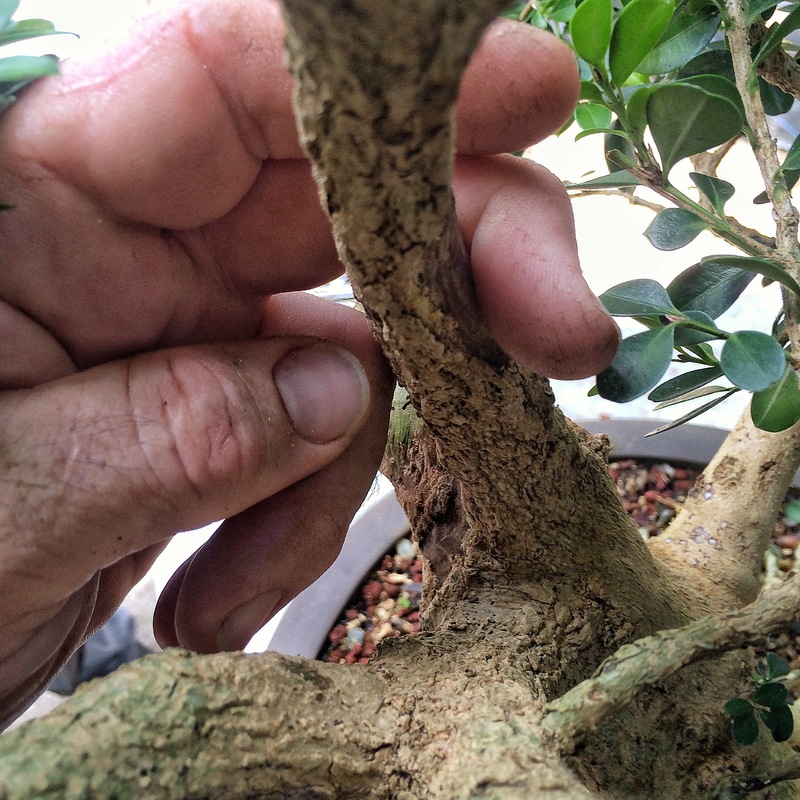 This is the new bud on a boxwood. The spearpoint looking thingy (technically the shape is called a a bodkin point, a spear/arrowhead point designed for piercing armor). 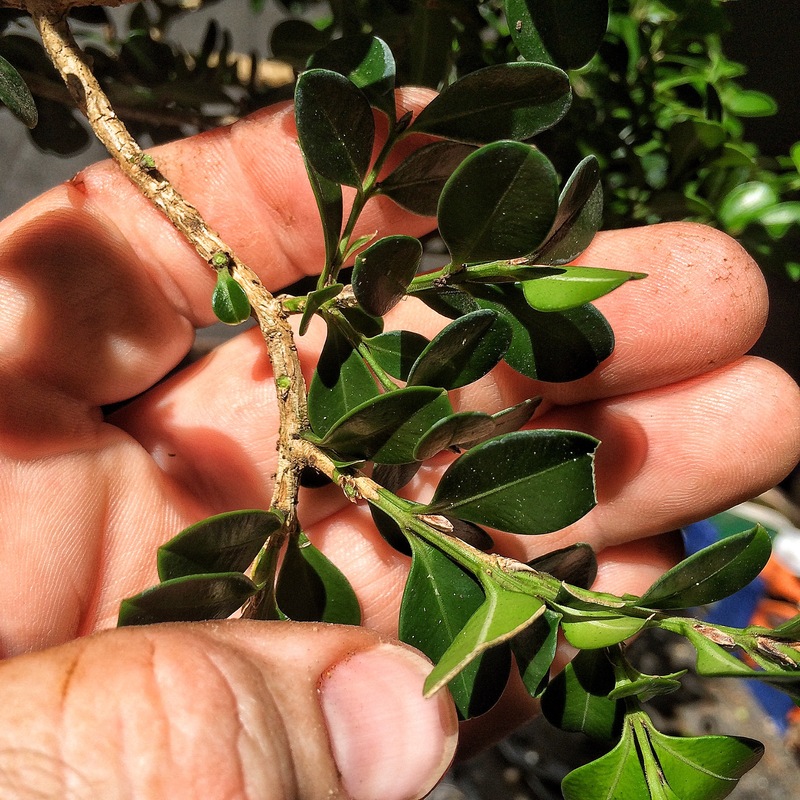 When removing the old leaf, make sure you don’t damage the bud, or the tree will have to waste energy making a new bud before it can replace the leaf. Now for some detail carving and lime sulfur. It’s going to be a year or so until the new deadwood ages and whitens (or greys out, really) to match up with the older deadwood. I’m not going to repot now (not the best time) but I think I’ll change the front just slightly when I do (around March). Maybe a rotation about 10 degrees counter-clockwise. Watch the Facebook or Instagram feeds for updated pics, I expect it to pop new growth pretty quickly. 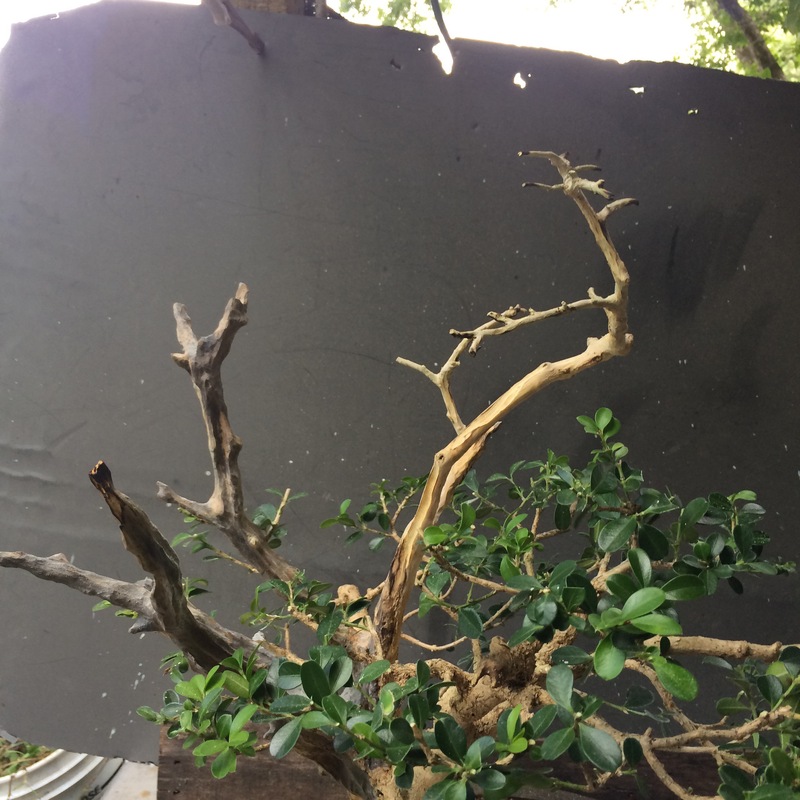 Fertilizer, light water and slight shade (for today, just to protect from sunburn on the branches with the heavy pruning I just did. But, in the winter, full sun, cold winds and boxwoods don’t go together. Those two things, cold and full sun, cause the boxwood to catalyze the chlorophyll in the leaves and turn it to beta carotene, changing them from green to orange. If this happens, you need to remove the orange leaves or they could kill the branch). And that’s all for today. 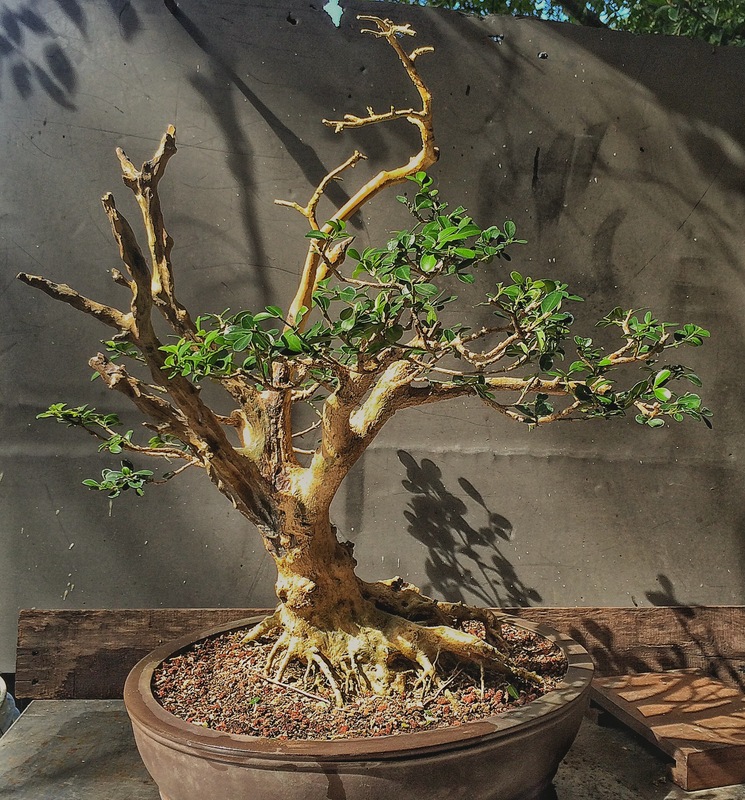 Next post, I’ll explore the neck bending actuality of a semi-cascade bougainvillea. Great post and I learned something. 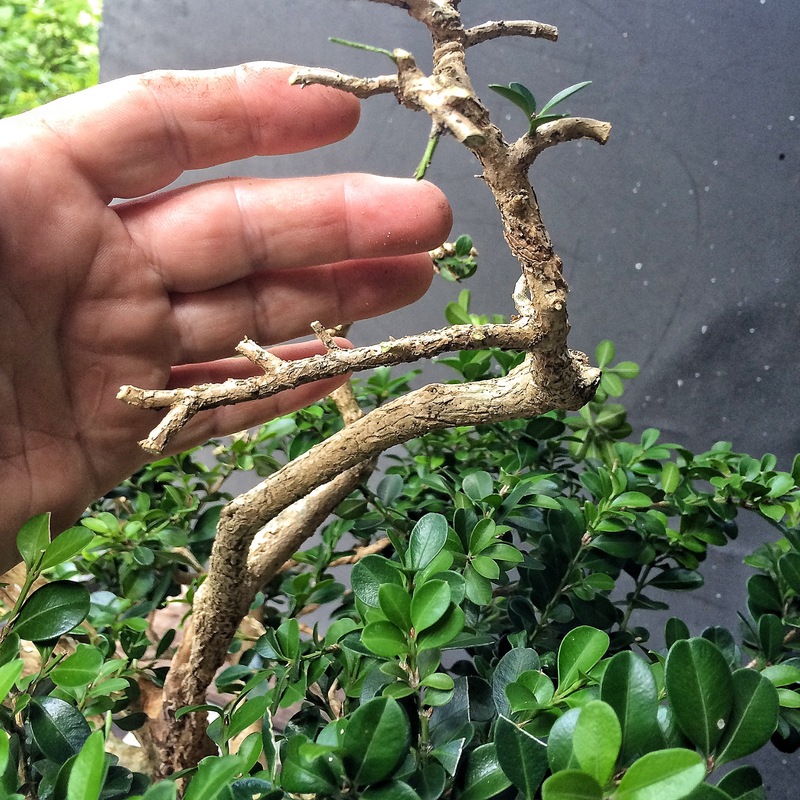 I’ll be moving my Boxwood stock into the shade when winter arrives. I had fun with the little game too. Odds bodkins, that’s a fine looking tree! 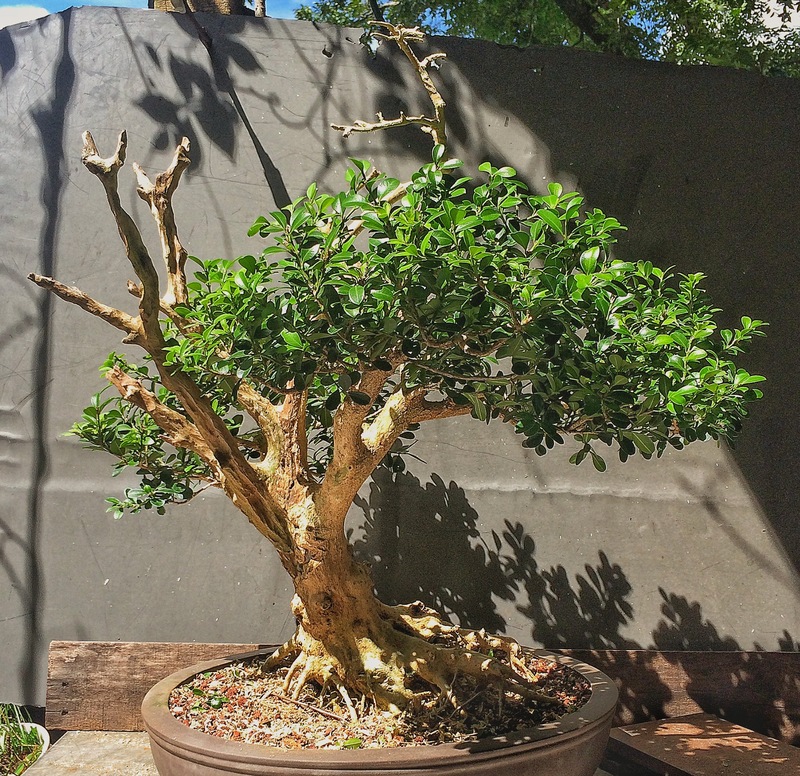 Information abounds for those of us who love boxwoods. I did not know about the beta carotene chemistry. I just boosted the fertilizer and it would usually change back to green. I’ll pay closer attention to this in the future. Great about the beta carotene! 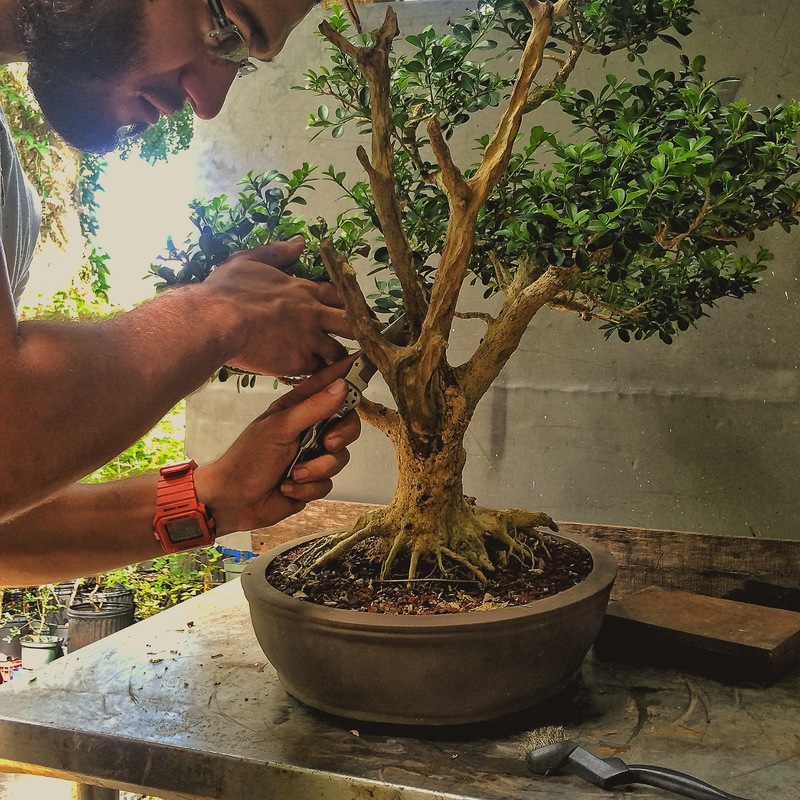 Even being a Tree Specialist, Bonsai is still a very complicated art! 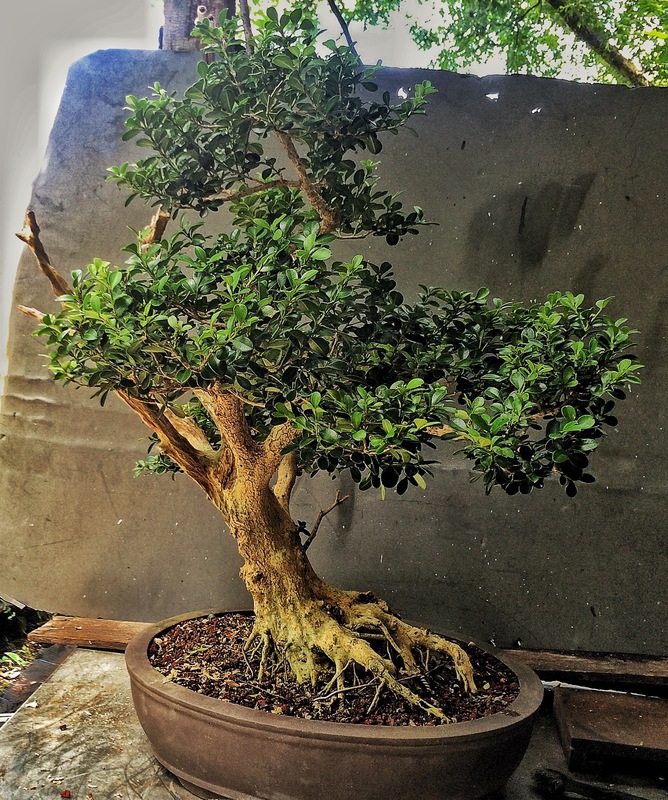 Hi Adam, do you have any new picture from this boxwood? If you go on my Instagram there is a pic from March 18. Since that time it’s filled in even more. Thanks, i just saw it. It really look great considering how was the first picture. Thanks for the lesson. Much appreciated! A lot of good info on this post, and the original! my favorite little nugget of info from the the original post, is regarding carving. To think of how the water would flow and to carve with that in mind. It is so true. I attempt to sculpt, and when I make rock landscapes I carve with that in mind!! Copy nature and all else will follow along! Bravo!! !